As a new American, Richard Reeves found the American ideal of equality and meritocracy refreshing, relative to the class-bound English traditions he grew up with—but he’s found the reality lacking. 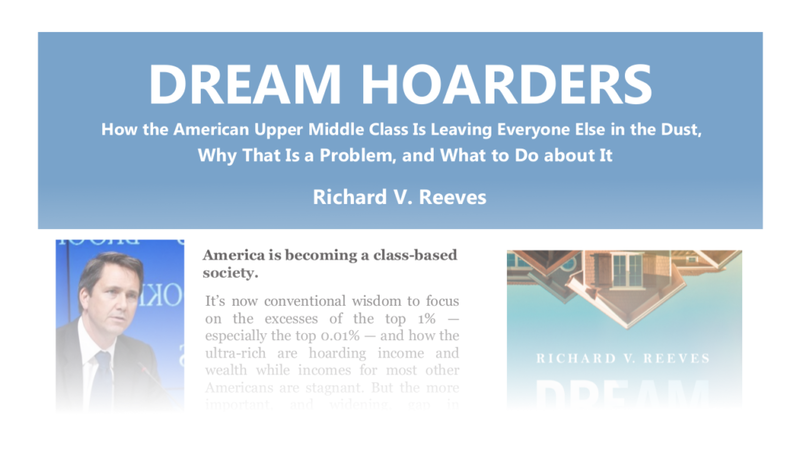 In his new book, Dream Hoarders: How the American Upper Middle Class Is Leaving Everyone Else in the Dust, Why That Is a Problem, and What to Do About It, Reeves highlights the widening gap between the upper middle class and the rest of American society. Reeves makes the compelling case that advantages are concentrated – not just among the top 1 percent that we commonly hear about, but also among the top 20 percent of earners, including journalists, academics, policy analysts and professionals, people like him—and perhaps like you? He argues that members of America’s upper middle class are becoming more effective at passing on opportunities to their children, and while he applauds good parenting, he notes systemic advantages—in areas ranging from the tax code to institutional practices of higher education institutions—limit the abilities of parents lower down the income scale to help their children connect to the best opportunities, resulting in less social mobility overall. How can we make our society more aligned with our ideals of openness and healthy competition? What can be done to create more equitable opportunities so that low- and moderate-income workers can attain stability and mobility? 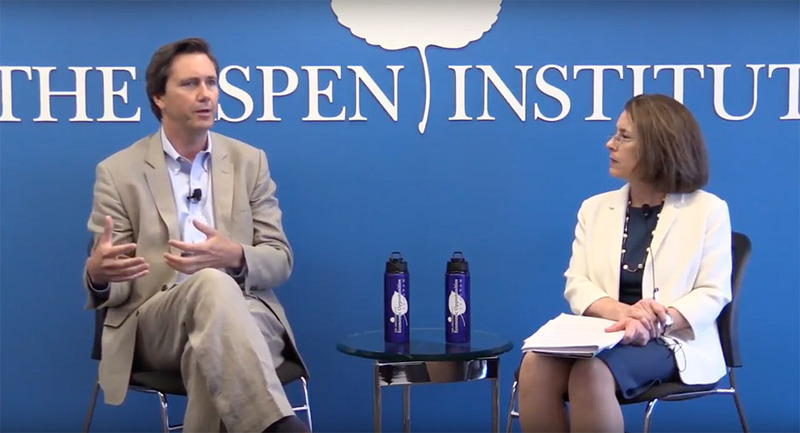 The Aspen Institute Economic Opportunities Program hosted our most recent Working in America event series, a conversation about the issues of wealth, class, and opportunity in America, as we discussed a new book and new ideas with Richard Reeves. Books were made available for sale and signing at the event. Richard V. Reeves is a Brookings Institution senior fellow in Economic Studies, policy director of Brookings’ Center on Children and Families, and editor-in-chief of its Social Mobility Memos blog. His research focuses on social mobility, inequality, and family change. A noted Brookings author, his prior works include Saving Horatio Alger: Equality, Opportunity, and the American Dream (2014), Character and Opportunity (2014), The Glass Floor (2013), and The Parenting Gap (2014). Reeves is a regular contributor to The Atlantic, National Affairs, Democracy Journal, the Wall Street Journal and the New York Times and has previously held senior advisory roles in a variety of economic think-tank and public policy analysis organizations. 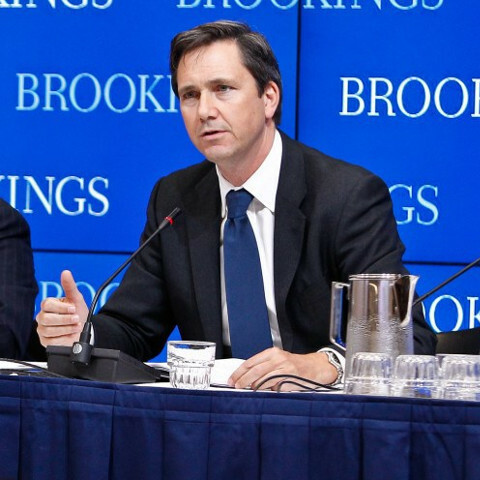 Prior to joining Brookings, he was director of strategy to the UK’s Deputy Prime Minister. Reeves earned a bachelor’s degree from Oxford University and a doctorate in philosophy from Warwick University. 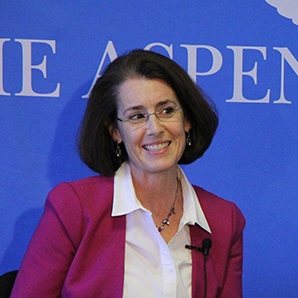 Maureen Conway serves as Vice President for Policy Programs at the Aspen Institute and as Executive Director of the Institute’s Economic Opportunities Program (EOP). Ms. Conway founded EOP’s Workforce Strategies Initiative (AspenWSI) and has headed up workforce research at the Aspen Institute since 1999. A nationally recognized expert in sectoral workforce development, Conway has authored numerous publications, including research reports, case studies, policy briefs, and co-edited the book Connecting People to Work: Workforce Intermediaries and Sector Strategies. Ms. Conway’s previous experience includes consulting for the Organization for Economic Cooperation and Development in Paris and work for the U.S. Peace Corps, where she advised on the design, management, and evaluation of the organization’s economic development programs in Eastern Europe and the Former Soviet Union. Maureen has an M.B.A. from Columbia University, a Masters in Regional Planning from the University of North Carolina, and a B.A. in economics and mathematics from Holy Cross College.